The website included an animated introduction reinforcing the messaging of the printed invite. Branding was extended to all elements of the decor. The cover of the invite had a spot varnish added to the black elements to make them pop off the red page. The gala design included coordinated letterhead, envelopes, reply cards, donation cards and forms, tickets, posters, event signage and many other elements. The multicolored tiers of tickets (VIP and standard) where distinguished easily by the event staff. The Hispanic Federation(HF), the nation’s premier Latino nonprofit membership organization, holds an annual star-studded gala to raise funds for their yearly operational costs. 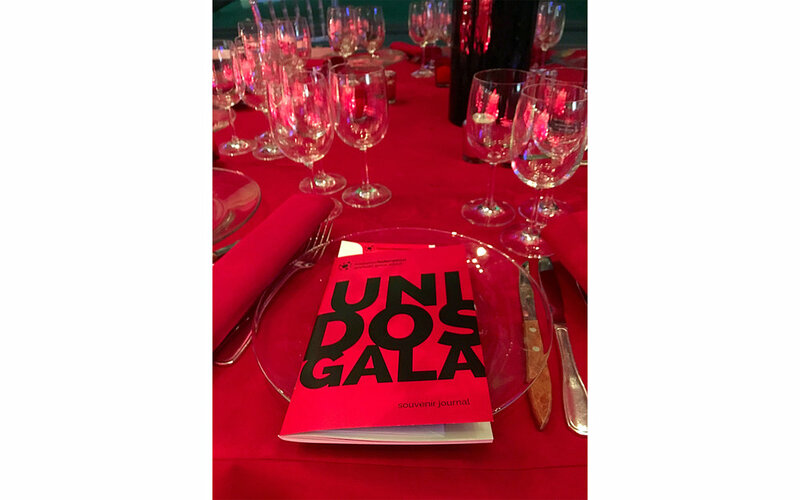 This year's theme of Unidos (Unity) was leveraged across print, event and digital assets. The bold and clean design helped the HF have their most successful gala to date, raising over $2.1 million dollars to support the HF and their outreach efforts.